The experience lived in this activity has been simply wonderful, this tour of only half day is perfect for nature lovers as me. 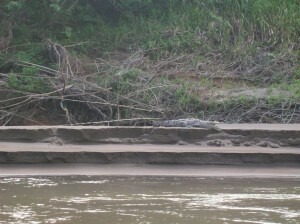 When I did Safari Float at the Peñas Blancas river throughout approximately 7 kilometers, I combined the exciting experience to float down in the water of a great river, while you observe plants, trees, monkeys, birds and others like an impressive caiman baby, which we found in a safe distance but apt to appreciate it in its totality. The guide with a great knowledge in the area did that the group of stranger people were only one. In fact; some foreigners asked for my help to take them some photos, later I did the same with them!!!. Now we interchange pics between us by e-mail. Besides what we learned while we were when asking to the guide on each thing that noticed interesting out of the explanation that he was giving us throughout the quiet river; we had a boy very funny, responsible and careful with every detail and need that we had while the route. 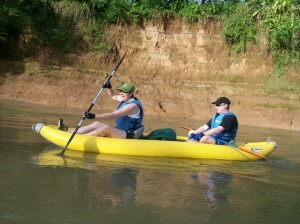 If you want to enjoy the nature in a safe and funny way, safari float is and will be the best option for you. Funny, peaceful and responsible are three words that describe my self. As Sales Executive I am in charge of giving answer to your questions and keep your trip in the best way as possible. I just try to be as I use to be in my daily life. Loving the nature and clear days. I enjoy my off time riding my bike around. La Fortuna Travel Guide © 2019. All Rights Reserved.